A horse-drawn carriage ride in Central Park, March 12, 2012. CENTRAL PARK — Advocates who have been crusading against the city's horse carriage industry for the last several years are reining back their strategy after a full-out ban on the rides proved to be out of reach. NYCLASS, which helped elect Mayor Bill de Blasio in exchange for his vow to end the carriage horse industry, announced new plans to advocate for the animals — including a push for legislation that would limit rides to Central Park, enact a mandatory retirement age and ensure the horses go to sanctuaries rather than a slaughterhouse, according to Chris Coffey, a spokesman for the organization. The group also hopes to regulate how carriage drivers book their rides — online, rather than on the street — to make it safer for horses who can then stay in the park. "There is a big difference being on the street in the middle of Midtown and being in Central Park, which is often shadier, there is less traffic and blaring horns that scare and spook horses," said Coffey. "If we can do that, we can more than make up for the horses that won't be hawking for folks on the streets of New York," he said. "They can be set up in Central Park, which is a much safer way for the industry to do well, and that way, horses will not be in a dangerous spot." NYCLASS's new strategy is focused more on the short term, after its previous campaign to completely ban carriage horses failed to take off. 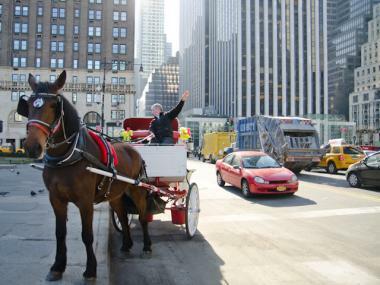 Last year, de Blasio briefly reached a deal with the carriage horse industry that would have allowed drivers to continue to operate as long as the horses stayed inside Central Park. But that compromise fell apart after the union that represents the drivers pulled out of the agreement. This time around, as the mayor is campaigning for re-election, NYCLASS is hopeful. "We have great support from members of City Council and the mayor has been supportive," Coffey said. "We believe the mayor will be supportive of our position." In addition to keeping carriage rides inside Central Park, NYCLASS plans to push for an increase in the size of horses' stalls to more than 60 square feet. "The NYPD stables are significantly larger than the stables for these horses," Coffey said. "Bernie Madoff has more room in his cell." But carriage drivers think NYCLASS is shifting away from its push for an all-out ban on their industry because New Yorkers ultimately like the horse-drawn carriage rides. "They lost on that fight. The people of New York want us to stay, and the City Council wants us to stay," said Christina Hansen, who acts as a spokeswoman for her fellow carriage drivers. She thinks the changes that NYCLASS is now advocating for would still harm the industry significantly, she said. The New York Daily News first reported on the NYCLASS's change in strategy.